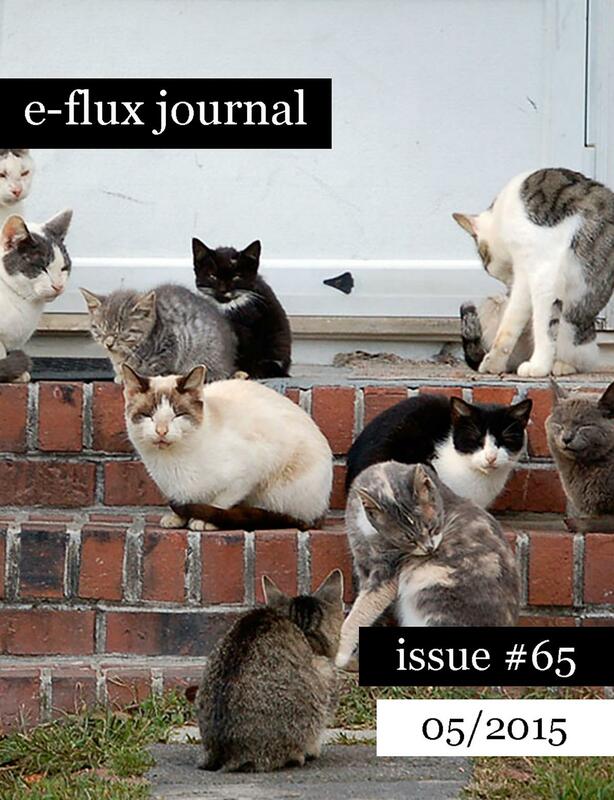 Cover of e-flux, issue 65, May 2015, courtesy e-flux. The Best Surprise Is No Surprise was published in 2006 (JRP Ringier) to commemorate the first decade of existence of e-flux, a bulletin with news of artistic events. It was unusual to say the least that a monograph edited by recognized figures of the art world would be devoted to an online newsletter. E-flux can be criticized, but it would be hard to ignore its influence on the global art circuit or dispute the team’s creative competence, including their artistic competence. E-flux is more than “just” a distributor of newsletters, and its creators display a range of talents extending beyond the portfolio of entrepreneurs of digital capitalism. E-flux is an artistic project, a curatorial platform, and a tool for self-reflection. Its creators have initiated, realized, and funded a number of ambitious ventures on a 1:1 scale, such as access to the library of Martha Rosler, the repository of artistic instructions Do it! (curated in cooperation with Hans Ulrich Obrist), and the Time/Bank installation exhibited among other events during Documenta 13 in Kassel. E-flux Journal, edited and published by the team, is one of the most important magazines of art theory and critical social theory. It continues on a global scale the long tradition of artistic self-reflection, journals, samizdat, and printed flyers published by artists. The report presented in exhibition consists of covers of e-flux, issues 0 through 70, licensed by the Museum of Modern Art in Warsaw for the duration of the exhibiton. Courtesy e-flux.